Years passed and for some reason, we moved that day off the Ireland itinerary because it just felt a bit soggy during the dark days of November when we were going. We freshened things up a bit… and it got removed. But this spring, it felt right to add it back in during a trip that would bring us through in late spring. When we got there, it was all blue skies and bright yellow flowers lining the trails. We got to see the incredible ruins and walk out to both of the lakes (about a 25 minute walk each way). Edie even took a killer nap- despite the struggle it was to push her stroller along the gravel path. Admittedly, I looked pretty pathetic- opting for a carrier or heavy-duty stroller the next time around! This is such an easy day-out from Dublin. Be adventurous and rent a car to make the most of the day. If it were me, I’d recommend heading out in the morning and go there first. (You don’t need a reservation to visit the ruins, but the visitors centre can be crowded. If so, don’t worry- you’re not missing much. Unless it’s pouring rain, and then its a nice shelter. 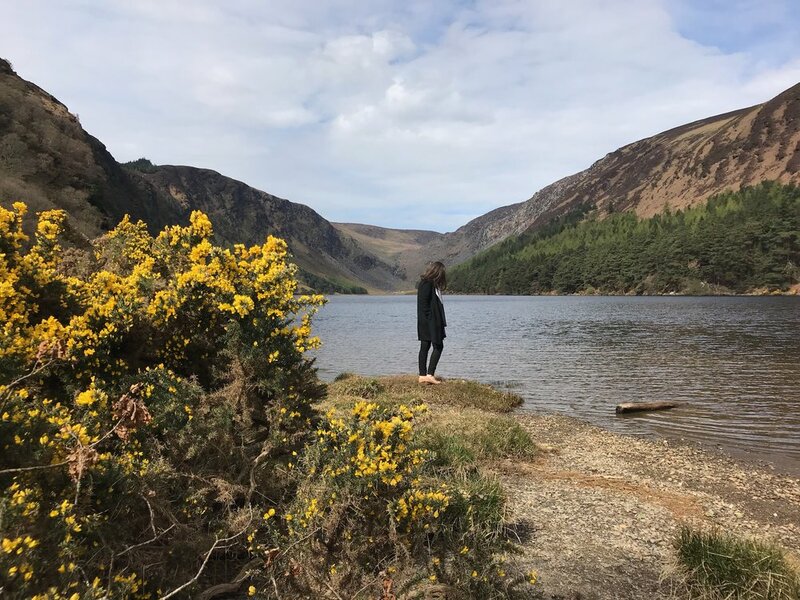 After you’ve seen it all, you can either drive to the Wicklow Heather nearby for a pub lunch surrounding by relics of Ireland’s great writers or you can opt to drive a bit further on to eat in the cafe at Powerscourt Estate. The food is killer, the shops have so many great Irish brands and treats to take home, and the views of the gardens from the outdoor terrace are stunning on a pretty day. It definitely is my favourite option, in case you were curious. If you’re looking for more of my favourite places in Ireland, look in my travel guide to Ireland for ideas and places we love!